For those seeking “off-the-beaten-track” holiday music, the Immanuel Church in Wilmington’s Highlands neighborhood was the place to be on Sunday, December 17, as Piffaro, the Renaissance Band, presented Es Ist Ein Ros, a German Renaissance Christmas. Piffaro’s Christmas program this season followed Welcome the People, the ensemble’s homage to the 500th anniversary of the Reformation and featured a host of beloved carols that serve as an integral part of Protestant worship to this day. If there’s one thing that emerged from this concert, it’s that Martin Luther loved Christmas and he loved music. While the Reformation was wringing out the ritual excesses of the late medieval church, Luther was working to integrate the simple unison plainsong and complex polyphony of the Catholic Church into his new Protestant liturgy. Luther also brought significant change by giving the congregation an active, musical role in church services through the singing of vernacular psalms, hymns and carols. 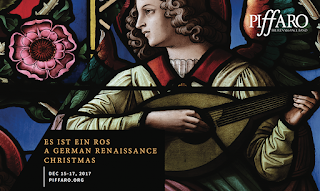 The beautifully curated program featured the refined Christmas music of Michael Praetorius (1571-1621) as well as compositions by Luther himself, including Veni, Redemptor gentium and Von Himmel hoch, which he wrote for his family’s Christmas Eve devotions. The concert also included works by among others, Johann Rosenmuller, Johann Walter, Johann Eccard, Hans Leo Hassler, Christoph Bernhard, Leon Paminger and Adam Gumpelzhaimer, all grappling with different ways of incorporating Italian musical forms into a Protestant liturgical design. There was sheer pleasure in the graceful melodies and interesting harmonies. The alternation of Latin and German texts and sophisticated and common musical forms engaged listeners on a variety of levels. The performance was everything you would expect from the musicians of one of the world’s greatest interpreters of Renaissance music. Intonation was flawless, the blend superb and the phrasing eminently convincing. Guest soloist Jessica Beebe contributed a soprano that was tonally pure throughout its range, applying it with the assurance of an artist fully cognizant of the demands of the music. There’s nothing quite like the sound of brass at Christmastime. Those radiant tones can transform even the grouchiest Grinch into a merry elf. In the Gold Ballroom of the Hotel DuPont Tuesday, December 12, a very appreciative and enthusiastic audience was treated to a variety of music courtesy of the Delaware Symphony Orchestra’s Brass Quintet. The five talented musicians — Brian Kuszyk and Steven Skahill, trumpets; Karen Schubert horn; Richard Linn, trombone and Brian Brown, tuba — gave concertgoers a veritable smorgasbord of styles from Renaissance dances to Broadway show tunes and, of course, some sounds of the season. The first half of the program featured three feisty dances by 16th Century composer Tielman Susato. This dance collection has become a perennial favorite with performers of Renaissance music, because its bald homophonic style makes it playable on just about anything. And that’s good news for the brass ensemble, which as a recent phenomenon, has very little repertoire written exclusively for it. Bach’s stately Contrapunctus 9 added a bit of gravitas to the mix. The Romantic Russian style of Victor Ewald’s Quintet No. 1 was the most conventional work on the program. Ewald — a close associate of the more famous composers of the “Russian Five” — wrote four quintets considered to be the first original pieces written specifically for the modern brass quintet. The musicians stuck a delicate balance by both blending their distinctive timbres and highlighting their individual lines with the unique sounds of their instruments. Lighter fare included selections from Leonard Bernstein’s West Side Story (Maria, Tonight and America) and Tchaikovsky’s Nutcracker Suite (March, Arabian Dance, Waltz and Trepak). The program concluded with the sounds of the season, including the traditional Ding Dong Merrily on High, The First Nowell, Coventry Carol, Rejoice and Be Merry and Joy to the World. The Nutcracker at The Playhouse on Rodney Square. Photo courtesy of Wilmington Ballet. The Good Girls appreciate the rich arts scene in Wilmington. Brenda is passionate about volunteering, food, the outdoors and learning tennis. Brynn, a 4th Grader, enjoys horses, traveling, singing and learning to crochet. Brynn's friend Madison joined us for her first theater experience. She is a 1st Grader who likes dancing, playing outside and solving math problems. The Nutcracker was presented at The Playhouse on Rodney Square on Saturday, December 2, and Sunday, December 3, by the Wilmington Ballet Academy of the Dance in its 60th anniversary year featuring the choreography of Artistic Director Jorge Laico. Based on Alexander Dumas’ The Story of the Nutcracker as adapted from E.T.A. Hoffman’s The Nutcracker and The Mouse King, the production featured the familiar, lively scores of P.I. Tchaikovsky. Our seats in the balcony provided a perfect perspective as the story was brought to life on stage in a feast for the eyes, ears and imaginations of children and adults alike. Brenda enjoyed the warm, nostalgic holiday gathering and dancing of guests in their period garb at the Stahlbaums’ home, where the nutcracker toy was presented to young Clara. 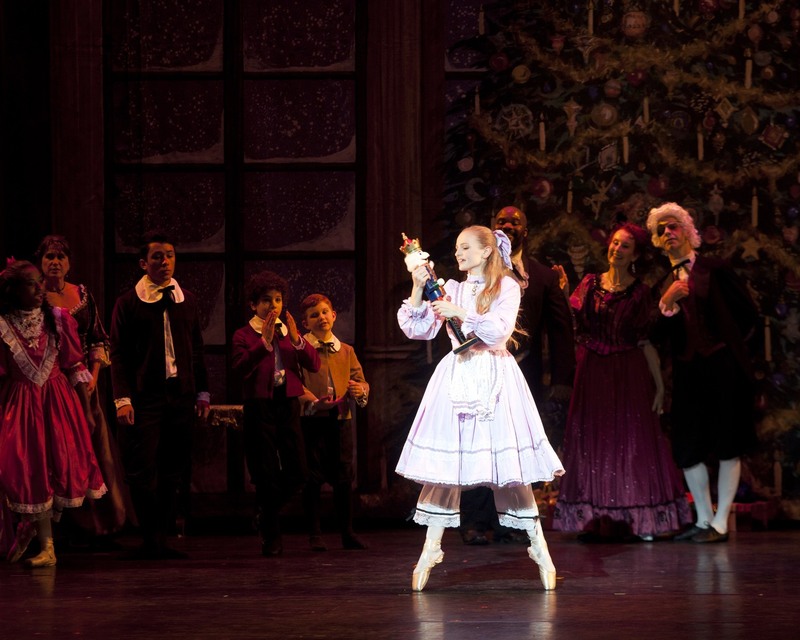 After her brother, Fritz, breaks it, Uncle Drosselmeyer bandages it and returns it to Clara, who falls asleep as her dreams unfold before the audience. 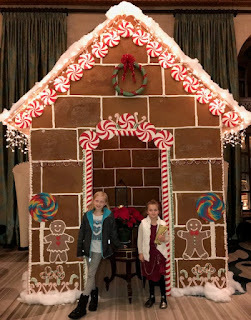 life-sized gingerbread house in the Hotel du Pont. The fierce Mouse King and his menacing yet musing minions of dancing mice arrived to fight the Nutcracker. The victorious but exhausted Nutcracker turns into a dashing prince who is transported with Clara to the magical Land of Snow. Madison exclaimed to us that, "...the dance [of the Snow Queen and King and their Snowflakes] was beautiful, and the ballerinas were Hallelujah good!" Brynn found it challenging that there were no speaking parts (a departure from her prior theater experiences) but appreciated that "...all the kids must have worked so hard to perform the dances so well." Her favorite character was the funny bearded man on stilts in a big dress! 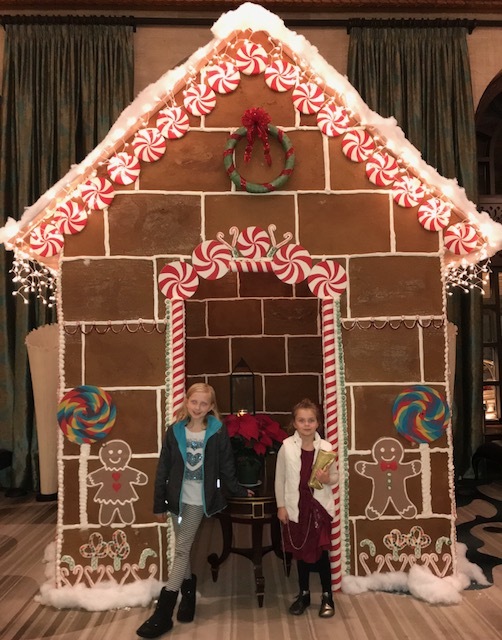 As the story resumed, Clara and the Nutcracker arrive in the Land of Sweets, where theater-goers enjoyed the real treat when the iconic Sugar Plum Fairy commanded a festival of dance. Beautiful costumery immersed us in exotic dance numbers from around the globe. Madison said, "...the music gets a thumbs up --- very, very good." and the audience obviously agreed, as they enthusiastically clapped a rhythm for the Ukrainian Trepak dance. Brynn fancied the Waltz of the Flowers with their beautiful floral wreaths. Soon, Clara and the Nutcracker Prince are sent on their way and Clara reappears sleeping at home by the Christmas tree. Was it all a dream? 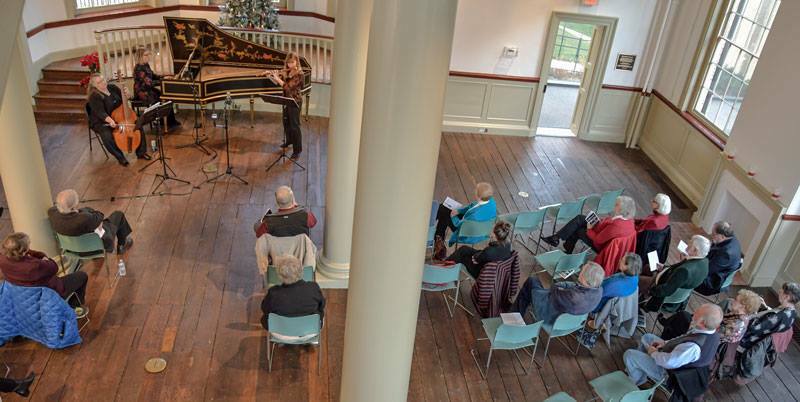 Mélomanie welcomed winter with a program of some very tuneful music on Sunday, December 3, at The Delaware Historical Society in downtown Wilmington. Sonatas, a traditional air, Christmas music, and of course, contemporary offerings were exquisitely performed by flutist Kimberly Reighley, gambist Donna Fournier and harpsichordist Tracy Richardson. Reighley and Richardson opened the program with a performance of the Sonata 4 in A major from Il Pasto Fido by Nicolais Chedeville, a Vivaldi contemporary who published the work under the more famous composer’s name. Reighley brought plenty of pastoral charm to the music with clearly shaped and articulated phrases and effective embellishments. Richardson offered strong support. The Sonata in D major by Boismortier found all three musicians playing sensitively. The phrasing was attractive with long, arching lines contrasted with taut, short ones. The harpsichord emerged from its role as “utility” instrument with Richardson giving energetic readings of Dupuis’ Rondo and Courante. Fournier offered a gentle and sensitive interpretation of the typically melancholy Greensleeves. Mélomanie’s contemporary side was represented by works of David Schelat and Mark Hagerty. Reighley and Richardson reprised Schelat’s Just a Regular Child, which was written for the ensemble in 2016. Schelat captured the whimsy of his childhood in Ohio in three movements: Rough and Tumble, Dreaming and Full of the Old Nick. Jangling harmonies of the third movement conveyed the mischievous nature of a young boy, while the soaring melody of the middle movement recalled endless days of daydreaming. Perhaps Schelat was looking to the day when he would become the virtuoso organist and composer that he is. Fournier’s gamba and Richardson’s harpsichord contrasted nicely in Arias, a movement from Hagerty’s Civilisation. That work was a recasting of the composer’s Clavier Book I, a work for harpsichord which explored what might have been had the music of the late Renaissance and Baroque not given way to what he terms the “less ambitious” Rococo and early classical styles. The three musicians concluded the concert with a performance of LaLande’s Noels en Trio, celebrating the Nativity and the upcoming holiday season. Photo by Joe del Tufo/Moonloop Photography. Cast members of CTC's Sunday in the Park with George. Sondheim isn’t easy. Broadway legends like Stephen Sondheim become, well, legendary because they challenge actors, musicians, directors, and audiences with their works. Sunday in the Park with George reminds us that the genius of Sondheim is in the story structure, phrasing, and music. City Theater Company has tasked itself to put on this challenging Pulitzer Prize–winning musical drama and does a solid job of it. 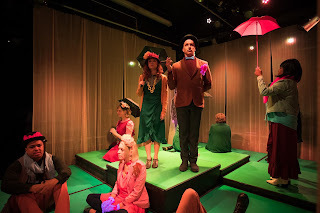 Sunday in the Park with George is a musical about the process of artistic creation — specifically George Seurat’s pointillist masterpiece, A Sunday Afternoon on the Island of La Grande Jatte. 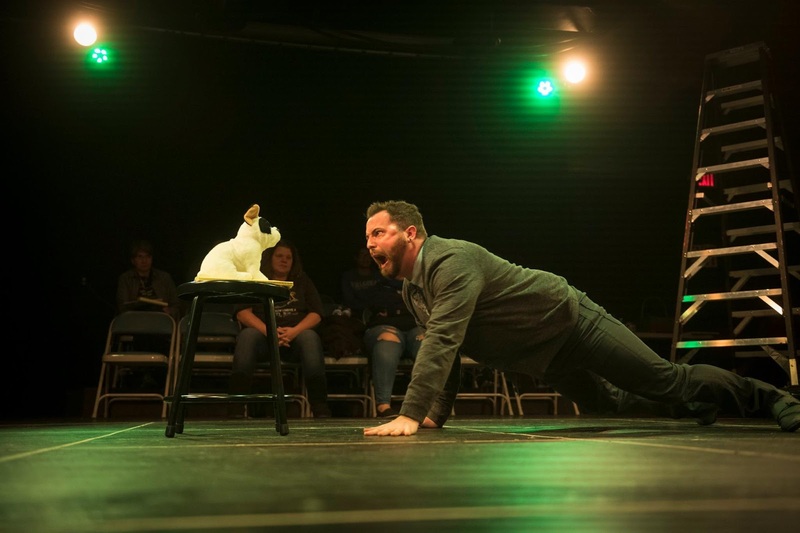 The show borders on being an experimental piece, which immediately means some theatergoers may not fully appreciate it. The music is often atmospheric and not front-and-center like traditional musicals. Having said that, the orchestration by Christopher Tolomeo is exquisite. Tolomeo also steps out from behind his piano to portray Louis the baker. Brendan Sheehan brings strength, insecurity, passion, focus and a tinge of madness to the titular artist who is toiling to excel in his craft. Sheehan’s voice is incredibly powerful plus he nails the difficult syncopated rhythms that are the trademarks of Sondheim’s music. The Dog Song was a show highlight for Sheehan as he crawled on all fours, barking and singing while addressing a stuffed toy dog George is studying for inclusion in his masterpiece. Driving some of George’s passions is the fiery Dot, played by an excellent Jenna Kuerzi. Dot has loving affection for George as well as impatience with his personality and frailties. Kuerzi wonderfully captures Dot’s struggles with precise movements to complement her superb singing voice. The parting lovers’ duet We Do Not Belong Together was haunting, with Kuerzi and Sheehan melding their voices beautifully. The remaining characters in Act I are all subjects George is studying while they enjoy their Sundays in the park. From young women looking for love to a disgruntled boatman to a child at play, the cast gives real depth to two-dimensional painted figures. The audience gains an appreciation for the subjects with brief snippets into their lives. The cast includes Jim Burns, Dylan Geringer, Jeff Hunsicker, Mary Catherine Kelley, Kerry Kristine McElrone, Paul McElwee, Patrick O’Hara, Dominic Santos, Grace Tarves, and George Tietze. Tonya Baynes and young daughter Layla Baynes round out the excellent company of actors. The interplay between O’Hara and Tietze as American tourists who dislike France but love its pastries was pure comedic gold. Co-directors Michael Gray and Tom Shade have made some interesting choices and most of them work. However, setting up the show to be something of a play looking at itself never gained traction in my eyes. Many of the props were inspired, like the cutout army officer and the aforementioned toy dog. The clever costume designs by Kerry Kristine McElrone and Lauren Peters began in monochrome. As George brings his inspiration from his head to the canvas, bright colors appear in clothing and accessories. In Act II, blacks and grays return as the story moves a century into the future. The second act is a coda, of sorts, and even involves some playful audience interaction. It’s a nice way to look back at the painted figures, the artist, the process, art in general and interpersonal relationships. Sunday in the Park with George will play Thursday through Sunday (December 7-10) and the following Thursday through Saturday (December 14-16). All performances are at 8:00pm except for the 2:00pm Sunday matinee on December 10. Be aware that the show runs a solid 2.5 hours which includes one 15-minute intermission. The Black Box is located at 4 South Poplar Street, Wilmington, DE 19801. Tickets are priced from $15 to $40 and can be purchased online or at the box office.